Elvis is a digital asset management system that stores and indexes images, videos, audio, documents and other content in one central place and provides you with tools to easily find your content again for (re)use. Elvis runs on a server and to manage and use content stored in Elvis, you'll need to connect to that server with the Elvis desktop client application. The desktop client only shows what is located on the server, all the files are stored there, not on your computer. The image below shows all basic functions and where to find them. 1. Search. Search by entering anything from simple keywords to advanced search operators. 2. Browse. 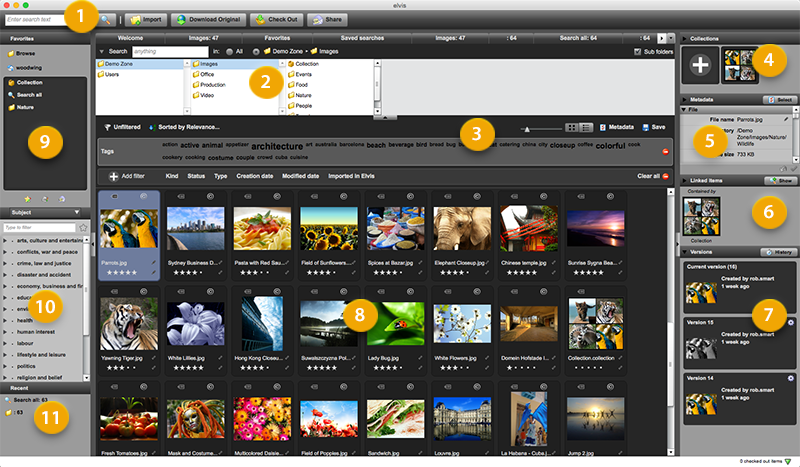 Browse through the file structure, showing files and Collections. 3. Filters and sorting. Filter the search results by using the filter and sorting options. 4. Collections. Create collections of related assets. 5. Metadata. View and edit asset information. 6. Linked items. See which items are linked to a selected asset such as other assets, Collections or InDesign layouts. 7. Versions. View previous versions of the asset. 8. Search results. View the results of your search, including configurable metadata, thumbnail size and flags. 9. Favorites. Store favorite Collections, searches or folders. 10. Taxonomy. Easily apply metadata to an asset based on a taxonomy list. 11. Recent searches. Quickly re-use a recently used search.